After a few bleak years, franchises can look forward to modest growth in 2012, according to a report released Monday. And that’s good news for the beleaguered economy, given the franchise industry's contribution to hiring and gross domestic product. Franchise businesses are expected to add 168,000 jobs next year, bringing the total number of jobs in the franchise industry to 8.1 million, according to the report released by the International Franchise Association, the industry's major trade group. The number of franchise businesses will increase by 1.9%, or 13,928 establishments, to a total of 749,499 in 2012, the IFA predicts. The sales of franchise businesses will grow by 5%, or $37 billion, the IFA expects, for a total financial output of $782 billion. While the franchise industry's outlook has improved, the sector has not yet returned to 2007 levels. "The rate of growth is far below the growth trends we experienced before the recession," said IFA President & CEO Stephen J. Caldeira in a written statement. Caldeira added that lower taxes for corporations and individuals as well as increased lending to small businesses would increase the industry’s rate of growth. 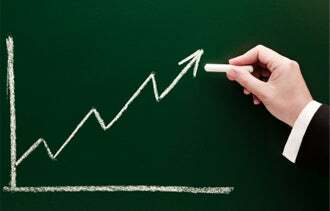 And even as the franchise industry begins to turn around, leaders in the sector -- both franchisees and franchisors -- are concerned with the slow pace of economic growth. In particular, more than 80% of franchisors said that tight credit impacts their ability to grow and more than 55% of franchisees say reduced access to credit has negatively impacted them, according to the IFA’s Annual Business Leader Survey. Also, respondents to the survey made it clear they were fed up with the stalemate in Washington. In particular, respondents to the leader survey said they felt a "lack of support for pro-growth small business policies," and a frustration with the "negative rhetoric coming out of Washington."